If you'd like to see a Java-enhanced version of this site, click here. This creek, nestled high in the Santa Cruz Mountains alongside the central California coast, is the source of many an inspiration. As you explore these pages you'll see the results of a few of them. 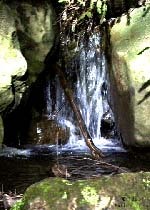 The studio is located on top of a few large boulders that overlook one of Enchanted Creek's small waterfalls. I, Michael Dunn, have lived here for over twenty years, creating art, working the land, building the studio, and kind of living like a Hobbit. Life here in this seclusion isn't always easy due to its remoteness, but it's a beautiful place and it offers me the the peace and quiet to help the studio and my art evolve in a natural progression. Sometimes the winters are pretty rough, with floods and an occasional snow, but those are often the times when I get the most work done inside, and when I have the opportunity to create some of my favorite pieces. Life is short and so I try to make each day a masterpiece. I hope you enjoy this site and find something that makes your day a little better. This site evolves in spurts as I get more and more of my work posted, so check in from time to time and see what's new. If you like, feel free to email me with any comments or suggestions. There are a few things you should know about these pages. This is primarily an art site, with a focus on images, which, in spite of all the tricks I know, still tend to take some time to load. I've avoided using things like music and animations to keep the load times down, but you'll still have to exercise some patience with a few pages. I do appreciate your interest in what I do, and hope that what you'll see is well worth the time you spend here. The links can lead you to a lot of other places, many within this site, many to other sites, and although a lot of them have a return link, some do not, so it might be a good idea to bookmark this page before you go any further. 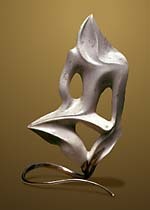 Art - This will lead you into the world of creation in which I dwell. Again, due to the nature of the Web the images may be slow to load, so please be patient. Graphics on the net are like this. You will see that I do a variety of types of art including Bronze sculpture, Two-dimensional Art, Digital Art, Woodcarving, Jewelry and Photography, to name a few. As you visit my other pages you'll find links taking you to other artworks such as new works and works in progress. If you see anything that you like but would want it a little different I do commissioned work as well. Here you'll also find links to my Résumé, and Artist's Statement, and example contracts appropriate for artists and gallery consignments and royalties. All the images you see throughout these pages are originals and are available as note cards or prints. If you are interested in purchasing anything you see on these pages or would like custom designed work in any of the media featured just drop me an email at michael@enchantedcreek.com. 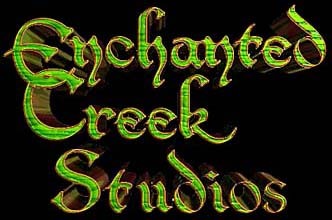 Enchanted Creek Studios - This leads into sharing with you, through text and pictures, the Studio and home, Enchanted Creek, which runs alongside it, the mountains that surround it, and the setting in which I live and work here in Santa Cruz County, California. Within time it will also be the window through which you may view some of the other interests that make life along Enchanted Creek so fulfilling. It's a beautiful place and it's a home base as well as a home, meaning I do occasionally travel and visit other natural wonders to gather inspiration for the art I do. In time this section of the site will be the gateway to share some of what I find to be inspirational. Me - Here is where you might find out a little about me in both my professional and recreational life. This is a catch-all portion of this site for all those things that can't, or won't, fit comfortably in the previous sections. I feel that there are some that want to know what's behind the artist, what motivates him, what inspires him, and where he's coming from. If this is of interest to you, then this is the section that will answer some of those questions. I'm an open book, and see no value in mystery, so feel free to ask about anything that seems unclear. I welcome the idea that people might want to know who I really am.